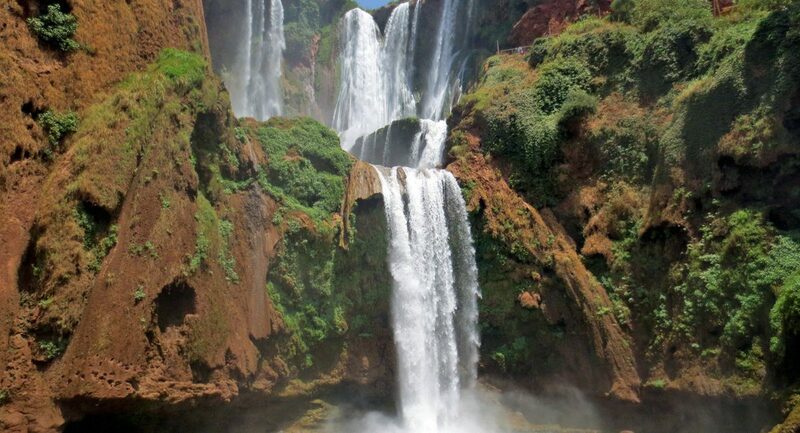 This one-day tour from Marrakech to visit the falls in Ouzoud is the best day trips from Marrakech, which will allow you to explore the highest waterfalls in North Africa. During this day trip you will learn about Moroccan traditions and old berber culture. Enjoy a traditional meal after a guided hike in the waterfalls. This one-day trip from Marrakech to visit the falls in Ouzoud is the best day trips from Marrakech, which will allow you to explore the highest waterfalls in North Africa. We start around 8.00 am from your accommodation in Marrakech. From there we will go to the mountains of the Atlas, not too far from Marrakech (160 Km). After crossing the fields of olive and almonds and dry land, we will reach the waterfall. We will meet a local guide who will take you to explore the waterfalls and the impressive falls over 110 meters above and banging against the rocks creating a fantastic rainbow and a natural magical spectacle. After the guided hiking tour in ouzoud, you will enjoy a traditional berber tajine in a local restaurant, then go to meet the Barbary macaque/monkeys living in the waterfalls. Then, free time to walk in the paths that surround the falls and around 4:30 PM, we will return to Marrakech. “End of Full private day trip to ouzoud waterfalls from marrakech”.